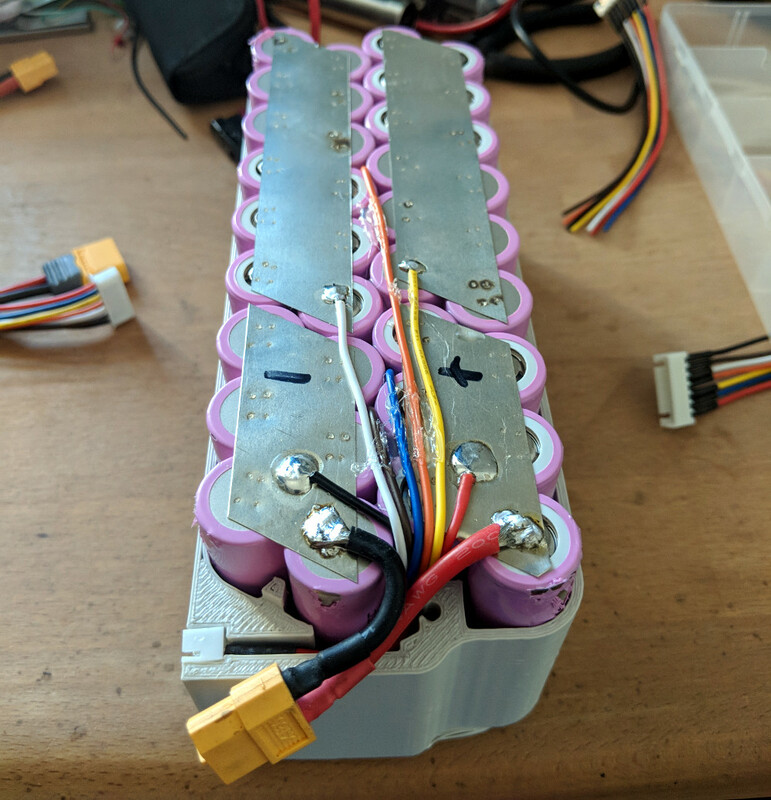 Though it might seem counter-intuitive, [Adam Pyschny] is of the opinion that the best way to keep his quadcopter batteries charged is to simply use another, much bigger, battery. Rather than mess around with inverters or generators, he can simply use a DC-to-DC battery charger and his huge custom-built battery pack to keep flying. The pack contains 36 Samsung INR18650-35E 3500mAh cells, which gives it a total capacity of 454Wh. At 1965 grams (4.3 lbs) the pack isn’t exactly a featherweight, but it’s significantly lighter than carting a small generator or even a lead-acid battery to the field. [Adam] designed a slick case in FreeCAD and printed it in Minadax ASA-X filament, which is specifically designed for outdoor use. A particularly nice detail in the case is that the balance connector (used to charge the cells) is cleanly integrated into the side of the pack, rather than just flapping around in the breeze; which annoyingly seems the norm even on commercially produced batteries. An interesting next step for this project would be the addition of a solar panel and charge controller to help recover in-between charges. Beyond an automated platform to swap the batteries for you, a DIY pack like this might be the easiest way to maximize the amount of time your RC aircraft are in the air where they belong. Cool project. Your comment about gas powered RCs reminded me…In 2006, MIT announced a silicon “engine on a chip”. There were articles about prototype microturbines the size of a quarter to generate electricity from other sources as well. Something like these are probably in the reach of today’s hackerspaces. That detail means you need cable to connect your battery to charger. In standard battery packs it’s left flapping so that you can position it where you have some space in battery compartment. when i saw this I initially thought he put this together to go into the believer to see how many hours of flight he could get, to bad that would be pretty cool, still a nice layout for the project. What is “the believer” ? been getting really good reviews. One guy out of japan has already got a 9 hour flight out of his with an expanded battery pack. Is not it better to have several similar charged batteries than to charge batteries in the field? Surely it will be less weight to transport. Yea not sure how this helps, as it requires time to change the packs between flights, and the big battery back itself later at home. Aside from conversion losses, there is a lot of time lost. Just charge extra batteries ahead of time for quick swaps. Might even be cheaper. I’m guessing you have no first hand experience with RC flying. Run time can be as short as 5 minutes on a pack depending on your setup. So rather than trying to take ~30 pre-charged batteries out to the field, you can take something like this and have the dead batteries charging while you’re running on the good ones. I actually have first hand experience. I didn’t consider the tiny 1s battery packs, I was looking at the larger 3s park flyers and delta wings. It takes awhile to charge those kinds of batteries to any useful voltage. “And when you get home you have a few small batteries and a large battery to charge. I can tell from experience that even with 4 chargers its not fun to charge 27 batteries. A lot of battery swapping…. >_<"
Its the same total number of battery charges / swaps. Its just a matter of if you do them in the field while you're having fun or at home where you presumably would be doing other stuff and leisurely change packs out on your charger. Your total number of charge cycles you have to do is based on how many times you discharge your packs with your RC equipment – plain and simple. Still seems to me like having one big battery and fewer packs simply forces you to do all that recharging in the field rather than at home, plus you have to lug out the charger, set it up in a suitable area, monitor the charge status of the packs, remember to swap them out in a proper rotation, allow packs to cool after charging and before discharging (and vice versa). Seems a hell of a lot easier to just show up with a backpack full of Li-po packs and enjoy not being anchored to your charge station and not have to think about recharging packs. Really nice thing to stick in the back of the car when you go out flying. Because otherwise, when you’re out driving in your car, there’s no other batteries or source of low-voltage DC available. So this is a great idea for that. Particularly if your car is a crank-starter from 1907. Solar would not provide any practical amount of recharging of the battery bank. I’m still confused as to why the money was spent on all those cells rather than just buying the equivalent capacity in extra Li-po packs. Li-po packs are typically cheaper per mAh, and you wouldnt have to wait around for them to recharge. Couldnt you just bring a cardboard box full of the equivalent total capacity in charge Li-po packs, use them one by one, and put the depleted ones in another box? Your day is done when the “charged packs” box is empty and the “depleted packs” box is full? Seems like this solution involves the same total usage time/capacity, but saves you from having to recharge packs during your outing. This would also save you from having to “fast charge” your Li-pos to get back to using them, and would probably also save money by spending on Li-pos rather than Li-ion cells. With all the post and comments around RC in drones, cars, boats etc I see negligible comments or observations about potential or practical problems putt these types of batteries in parallel with no problem issues for either charging or discharge issues. With the latest Li state of the art has that been effectively solved as in no long term problems balancing and no real catastrophic issues either since the earlier days, in other words have incremental tech improvements last few years quashed any concerns about that ?